Novelty architecture refers to buildings with unusual shapes, or whose existence exists for the purpose of advertisement. 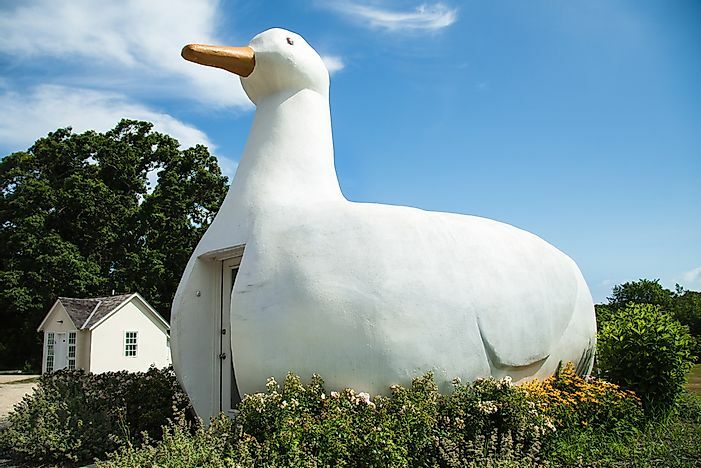 The Big Duck of Long Island, New York, is an example of novelty architecture. Novelty architecture is a unique type of building that expresses itself through its unusually literal appearance. The purpose of this could either be a way of advertising a product or creating a tourist attraction. The style is said to have been created in the United States around the emergence of the popularity of the automobile, and the tradition of partaking in road trips around the United States to view famous novelty architecture remains commonplace in American culture today. Novelty architecture can also be known as programmatic or mimetic architecture. Sometimes the buildings of novelty architecture may even take the shape of the items that they sell. Besides advertisement, novelty architecture is sometimes used to commemorate events. There are three types of architectural designs grouped under novelty architecture. Programmatic architecture whereby by buildings are ‘programmed’ to mimic and advertise the functions of a particular building through the use of shapes of animals, foods or people. The style was also employed in building water towers and storage tanks to attract tourists. Giant Sculptures which were mainly used to attract customers, especially through souvenir shops. These sculptures are unusually large representations of normal objects such as guitars. Buildings constructed using this style include the Golden Guitar in Australia, Mummy’s Cupboard in Mississippi and the Hat ‘n’ Boots filling station in Seattle. Such buildings are located along roads and in museums. Styling buildings after famous landmarks is used to replicate existing buildings or structures as an adaptation or imitation of an existing building to give the ‘feel’ of such areas. Amusement parks, casinos, and restaurants mostly employ this style. Iconic architecture (unique to a brand), googie (using sharp angles and creative designs), and deconstructionism have also been considered a form of novelty architecture. Some architectural critics, however, argue that deconstructionism is not a kind of novelty architecture. While some buildings made in this style are still functional, many have ended up non-functional and in a state of disrepair. Since most of these buildings were built along roads, construction of interstate highways has led to reduced traffic on previously busy roads leading to the death of these businesses. Some of the buildings have been moved to other locations, placed in museums, or sold off while others were demolished. Contemporary and novelty architecture have a lot in common. However, contemporary architecture is considered to be a modern architectural style which combines a variety of styles within. However, some architectural critics argue that many of the styles in contemporary architecture are in fact, novelty architecture.